It's not easy being Green! Just ask Tim Masters, owner of the My Green Mattress Company; I'm sure he'd aggree. It is after all, easier to build a mattress using synthetic foams and fabrics. It's also easier using dangerous flame retardant chemicals instead of Natural Wool. The difficult part was watching his daughter's own surroundings cause her discomfort. Emily, suffered from Eczema and allergies aggravated by the bed she slept in. ​Her condition was the inspiration behind My Green Mattress. The goal being an all natural line of Hypoallergenic beds. This prompted the start of extensive research and medical consultation. Tim was advised that all natural products could ease Emily’s Symptoms. While building the prototype for her mattress, he saw an opportunity. A chance to not only help Emily, but to fill a void in the bedding market. Concluding that a healthier sleep environment benefits everyone, My Green Mattress was born! Your mattress will typically arrive via FedEX within one week. Pretty impressive considering it does not go into production until your order is received. How will my mattress be shipped? FedEX will deliver your mattress wrapped in both heavy plastic and cardboard. My Green Mattresses are heavy. Always have a second set of hands available to move your bed. Tip: Don't unpackage your mattress until it's in the room where it will be slept on. Organic Cotton, Natural wool and Dunlop Latex do not off gas toxic odders. They can and do sometimes omit natural odors. These scents are not unpleasant or harmful and dissipate in a short period of time. Do I need a foundation​? If your mattress is going on a basic metal frame, you will need a foundation. We would not recommend using your old foundation unless in pristine condition. A new mattress can fail quicker if not on a proper foundation. Platform beds do not require a foundation. However, they may need a bunkie board to add additional structure. If platform has slats that are more than 3" apart, always go with the bunkie. Memory foam is a synthetic material derived from petroleum products. It's known for providing pressure relief and limiting motion detection. By design it responds to body heat so it has a tendency to sleep warm. Because you sink into memory foam, it can limit movement. Mild to moderate off gassing has been reported by a small percentage of customers. Natural Dunlop Latex is made from the sap of the rubber tree. It is also pressure relieving and conforming. This foam is extremely buoyant and is described as having a bouncy feel. Ease of movement is much greater than Memory Foam and it sleeps naturally sleeps cool. There is no off gassing with Natural Latex. What if I have allergies to Latex? Only a very small percentage of the population actually has a latex allergy. Reactions occur with direct contact. So even if you were allergic and were unaware, it's doubtful issues would occur. However, If you have a confirmed allergy, we would recommend considering the Pure Echo. Same great support but with no latex. My Green Mattress is happy to send samples of their latex to text for allergic reactions prior to purchase. Body Impression, or silhouetting, are not only normal but useful. They are part of the break in process of a mattress and conform to your unique body type. The industry standard is 1.5 inches while not on the bed. More than this depth is generally considered a factory defect. 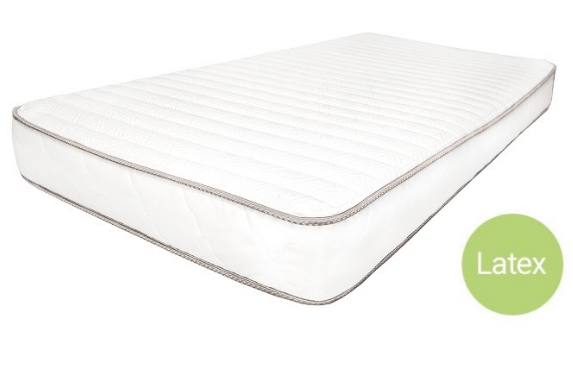 Our My Green Mattress Review takes an in-depth look at The Pure Echo. It's the Company’s best selling bed. Hand crafted and all natural, this mattress offers an innerspring alternative. Rather than an all foam bed in a box option, Pure Echo offers a quality innerspring. Great value and being environmentally responsible is the My Green Mattress business model. 4 Zoned Individual Pocketed Coil System: The mattress consists of a 15.5 gauge Coil at the head and foot. A 14.5 gauge “nested” coil is used on the center third. Nested coils are offset to fit more steel in the same space. That combined with the heavier gauge provide more structure where you need it most. Not only does it offer better lumbar support, it prolongs the life of the mattress. Over ½ of your body weight rests within that center third of your mattress. No one complains about the head or the foot of their bed sagging. The importance of a this design can not be understated. In addition, the mattress is surrounded by a 13.5 gauge perimeter coil. This gives you more solid edge protection as well as a true edge to edge comfort feel. 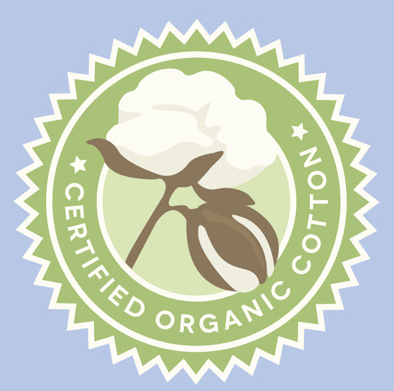 Heavy Organic Cotton: All natural Needle Punched Cotton insulates and provides padding. Quilters and crafters trust and love natural cotton due to the time proven qualities. 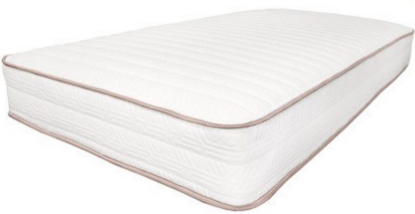 Quilted Cover: The Pure Echo mattress is covered with Organic Cotton and Oeko-Tech Certified Natural American wool. 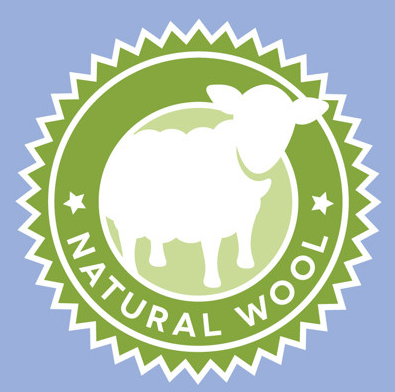 The wool is a natural fire retardant. It chars but will not burn. It is used in place of potentially dangerous chemical flame retardants. Since 2007, all mattresses sold in the US need to pass federal fire safety guidelines. Using natural methods is not the easiest way to produce fire retardant beds. It is, however, the safest, most eco friendly method. The Pure Echo is rated as a Medium Firm. This mattress is best suited for back and stomach sleepers. Side sleepers may find this mattress a bit too firm for the shoulders and hips. For those seeking more pressure relief and conformity, consider the Natural Escape. This mattress takes the next step in luxury by adding adds 3” of Natural Dunlop Latex. See our review of this mattress further on this page. The pure Echo by My Green Mattress is an exceptional value. More proof that you don't have to pay high retail prices to get a great night’s sleep! Check out prices for both one and two sided flippable mattresses. Delivery to your door is Free to the Continental 48 United States. Additional fees apply to deliveries for Alaska, Hawaii, and Canada. In home white glove delivery and setup is $99. Old bedding can be removed for $35 but only if white glove service is purchased. My Green Mattress offers a 100-Night Sleep Trial. If not completley satisfied, your mattress may be returned or exchanged. If original purchase is upgraded, buyer is responsible for price difference. My Green Mattress comes with a 10 Year Non Prorated Warranty​. Refer to manufacturer for complete terms. Pure Echo is handcrafted with all-natural, hypoallergenic materials. 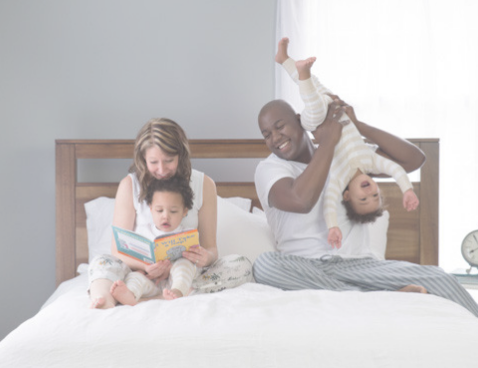 Proudly made in the USA, this exceptional mattress bridges the gap between quality and budget. Its individually pocketed posterized coil system provides great support and alignment. Heavier gauge nested coils in the center third support where you need it most. Organic cotton and natural American wool make up the cover and padding. There is plenty to like here even before you talk about how environmentally friendly the mattress is. The company's commitment to helping create a greener world is just the icing on the cake! This mattress has a medium firm feel and is best suited for back, stomach, and some sleepers. If you are a side sleeper who prefers a softer feel, take a look at the Natural Escape. Same great support, more softness for the shoulders and hips. The mattress is delivered free of charge and is backed with a 10 year warranty. Take 100 days to decide if it's right for you. If this mattress does not meet your expectations. Return it for a full refund. The Pure Echo exceeds standards for support and comfort. Although not a 100% organic mattress, we applaud their commitment to reducing the size of their carbon footprint. Great Value at a great price. Try it risk free and support an awesome company! The "Pure Echo" by My Green Mattress has earned a 4.5 out of 5 star rating with BestSlumber.com! Natural Excape is the My Green Mattress Company’s hybrid addition. Hand crafted and all natural, this mattress offers the same great innerspring construction of the Pure Echo. It then adds a 3 inch layer of Natural Dunlop Latex to give the mattress a softer, more forgiving feel for the shoulders and hips. This makes the Natural Escape a favorite among side sleepers. Keeping with the environmentally responsible attitude, Natural Escape is also a great dollar value! 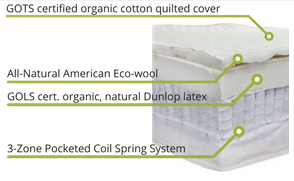 ​Quilted Cover: The Pure Echo mattress is covered with Organic Cotton and Oeko-Tech Certified Natural American wool. The wool is a natural fire retardant. It chars but will not burn. It is used in place of potentially dangerous chemical flame retardants. Since 2007, all mattresses sold in the US need to pass federal fire safety guidelines. Using natural methods is not the easiest way to produce fire retardant beds. It is, however, the safest, most eco friendly method. ​The Natural Escape has a Medium to Medium Soft feel. The addition of 3" of Natural Dunlop Latex makes this mattess a softer more pressure relieving feel than the Pure Echo. Natural Dunlop Latex has a buoyant feel that creates the sensation of floating on top of the foam. Combined with the zoned poketed coil system, this bed offers great support and comfort. Side sleepers will tend to appreciate the extra conformity. That said, it is not too soft for the majority of back sleepers. The extra bounce the latex provides works well for both kinds of sleepers. ​The Natural Escape by My Green Mattress is an exceptional value. This exceptional hybrid offers the best of both a traditional innerspring and a Natural Latex. Check out prices for both one and two sided flippable mattresses. ​Delivery to your door is Free to the Continental 48 United States. Additional fees apply to deliveries for Alaska, Hawaii, and Canada. In home white glove delivery and setup is $99. Old bedding can be removed for $35 but only if white glove service is purchased. My Green Mattress offers a 100-Night Sleep Trial. If not completely satisfied, your mattress may be returned or exchanged. If original purchase is upgraded, buyer is responsible for price difference. ​The Natural Escape offers the same exceptional innerspring support as the Pure Echo. Pocketed, Zoned Coil construction gives you support where you need it most. Heavier gauge coils in the center of the mattress offers premium lumbar support. It's also where 50% of body weight is carried so it prolongs the life of your bed. The addition of 3" of Natural ​Dunlop Latex provides a softer more forgiving feel. This is great news for side sleepers who want support but extra pressure relief for the shoulders & hips. Natural Dunlop is very buoyant and adds a little bit more bounce than standard foams. 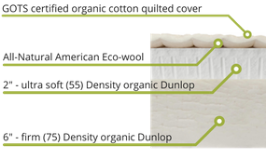 Quilted Cover: The Pure Echo mattress is covered with Organic Cotton and Oeko-Tech Certified Natural American wool. The wool is a natural fire retardant. Priced well below most comparably specced mattresses, The Natural Escapes is an exceptional value. Although not a 100% organic mattress, we applaud their commitment to reducing the size of their the carbon footprint. Great Value at a great price. Try it risk free and support an awesome company! The "Natural Escape" by My Green Mattress has earned a 4.5 out of 5 star rating with BestSlumber.com! 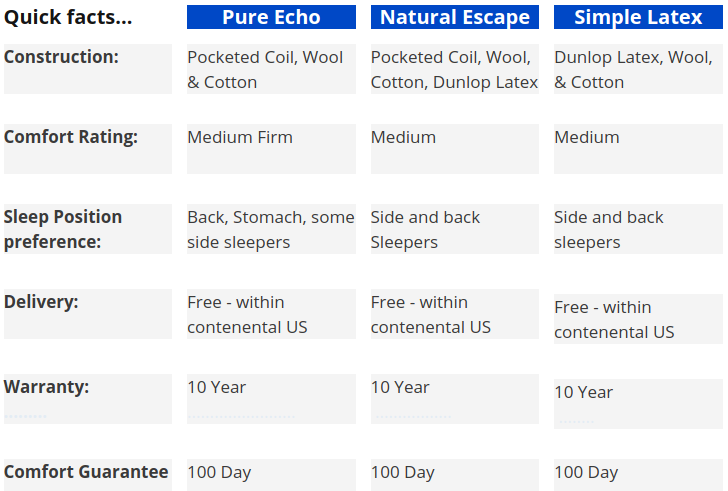 The Simple Latex is the My Green Mattress company's entry into the spring free bedding market. Handcrafted from all natural materials, Simple Latex offers a healthy way to attain a great night's sleep. Natural Dunlop Latex Core: provides buoyant, pressure relieving support. The latex used in this mattress is independently tested and Certified to meet GOLS standard. Cover: Manufactured with GOTS Certified Organic Cotton and Oeko-Tex Certified Natural American Wool. This cover is breathable and sleeps cool and comfortable. Wool is a natural fire retardant. No toxic chemicals are needed. The 7” Simple Latex is a firm 32-36 ILD / Density: 90 mattress. It offers great support and spinal alignment best suited for back and stomach sleepers. For the majority of side sleepers, this mattress may be a bit too firm. 6 inches of GOLS Certified Organic Dunlop Natural Latex with a 26-28 ILD / Density. A second 2” layer of Ultra Soft Organic Latex is then added. This creates a more conforming, more forgiving feel for side sleepers. ​The Simple Latex by My Green Mattress is among the lowest priced Natural Latex mattresses sold anywhere! Its competitively priced with standouts like Zenhaven and Spindle. The Simple Latex has emerged as one of the best values of 2017. The Simple Latex by My Green Mattress is one of the best priced all Natural Latex mattresses on the market. The core is made of 100% Organic GOLS Certified Dunlop Latex. It is both conforming and pressure relieving. Cool sleeping with no off gassing, the company remains dedicated to environmental responsibility. Simple Latex is available in a 7" or 9" mattress. The 7" is a true firm and ideal for a back or stomach sleeper who requires a more structured feel. The 9" is topped with a 2" layer of Ultra Soft Latex. It provides a much more forgiving feel on the shoulder and hips. This mattress is a great choice for side sleepers. Priced well bellow most comprably speced mattresses, The Simple Latex is an exceptional value. We applaud their commitment to reducing the size of their the carbon footprint. Great Value at a great price. Try it risk free and support an awesome company! The "Natural Latex" by My Green Mattress has earned a 4.5 out of 5 star rating with BestSlumber.com!